Glimepiride 4mg 30 Tablets is a medicine taken by mouth to help lower blood sugar. 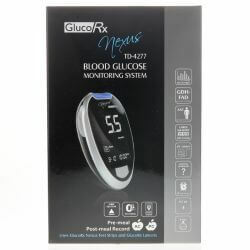 It is used in those that have been unable to successfully control there blood sugars by diest, exercise and weight reduction alone who have Type-2 diabetes. 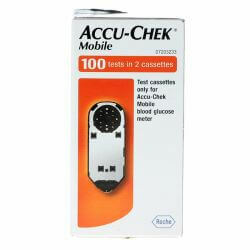 It works by increasing the amount of insulin released from the pancreas, the insulin then lowers the blood sugar level. Keep this medicine out of reach and sight of children. Do not store above 30 degrees celcius and protect from moisture. 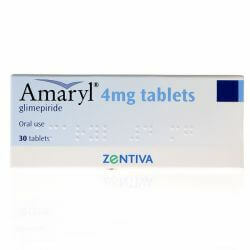 Glimepiride 4mg 30 Tablets are to be taken by mouth, just before or with the first main meal of the day (breakfast). Swallow the tablets whole with atleast half a glass of water. These tablets should not be crushed or chewed. The usual starting dose is one tablet (1mg) once a day, if necessary the dose may be increased by the doctor to a maximum of 6mg once a day. If you take more then your prescribed dose, there is a danger of hypoglycaemia. You must instatnly consume enough sugar to counteract this (e.g small bar of sugar cubes,sweet juice,sweetened tea) and inform a doctor immediately. If you forget to take a dose, do not take a double dose. Take this medication exactly as the doctor has instructed you to and keep taking unless your doctor tells you to stop. The active substance in Glimepiride 4mg 30 Tablets is glimepiride. The other ingredients differ depending on manufaturer. Please read the patient information before taking. As with all medicines glimepiride can cause side effects although not everyone experiences them. If you do experience any of the side effects in the patient information leaflet or any not listed please consult your doctor or pharmacist.